Black Cats and Dumbos: WWII's Fighting PBYs, by Mel Crocker. Sites I manage are powered by lunarpages. Its storage capacity and bandwidth are huge, with more e-mail accounts, MySQL databases, and a multitude of scripts to set up your own Blogs, CMS, e-commerce, etc., etc., etc..
Gary's Blog will accumulate his thoughts on a number of topics. As a start (4/3/06) he's posted some background on why he retired from Boeing. Click here to see what he has to say. For the time being this page will provide a link to projects by Gary Crocker. Please bear with its disorganization. Perhaps the day will come that it has a coherent pattern. November 6, 2004. 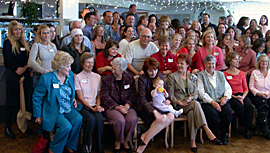 Approximately 100 former students and teachers of Westminster Christian Schools gathered for a reunion at the Newport Beach Country Club. It included students and teachers from as far back as 1975. Watch here for a possible WCS Alumni/Teacher web site. I'll need help with its content. The following uses a song performed by the Novelaires to test of my newly learned, but certainly not mastered, skills with Macromedia Flash MX. This may also develop into a site for the Novelaires. If it doesn't show up or play, you will need to get the Flash Player. You can do so by clicking this link beneath it.